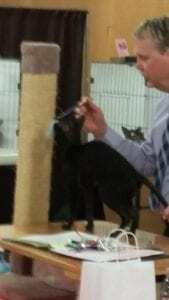 Brian Pearson, was working ring number three at the Cat Fancier Association show which was held this past weekend. The event was hosted by the Frontier Felines local cat club. Shows are held in Gardner, at the Johnson County Fairgrounds sever times a year.